A generous alumni grant from Audubon’s Toyota Together Green Fellowship program helped bring alumnus fellow Melanie Allen of the Conservation Trust for North Carolina (CTNC) together with KUA in a project to connect the communities in which they work and find potential opportunities to increase diverse, grassroots participation in the upcoming IUCN World Conservation Congress. Every four years, the Congress brings together leaders from government, the public sector, non-governmental organizations, business, UN agencies and indigenous and grassroots organizations to discuss and decide on solutions to the world’s most pressing environment and development challenges. In September 2016, the Congress will be hosted by Hawaiʻi. 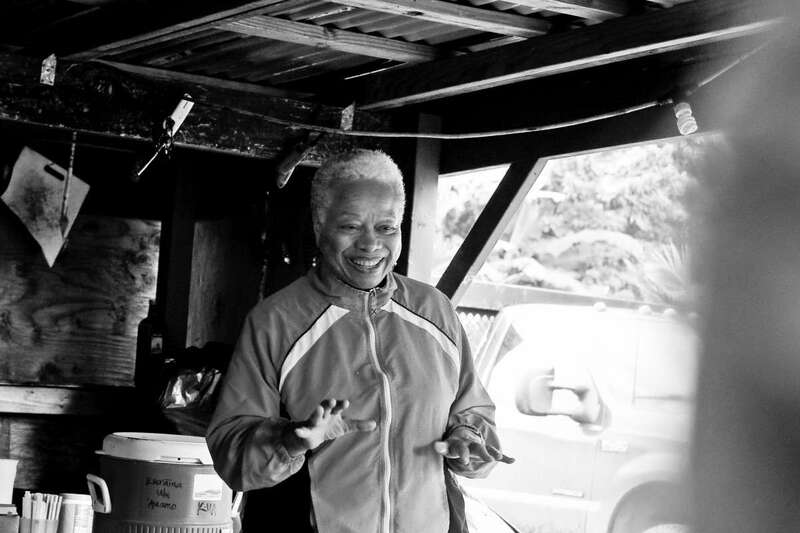 The communities with which CTNC works through Melanie Allen’s project are predominantly rural African American heirs’ property owners in the Coastal and Sandhills regions of North Carolina. 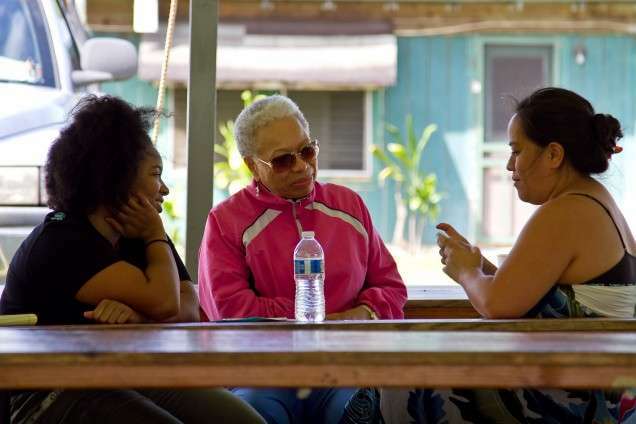 Melanie brought Ammie Jenkins, Executive Director of the Sandhills Family Heritage Association for a weeklong work exchange with KUA communities in Hawaii. It was a stormy week. Mel and Ammie braved rain and mud and met with well over 30 community members from four communities, in 5 rural site visits, 15 Commissioners from the IUCN Commission on Environmental, Economic and Social Policy, as well as a small visitation with KUA friends and family involved with Hawaii land trusts. The week was packed with activities — the seeds of many new connections planted. 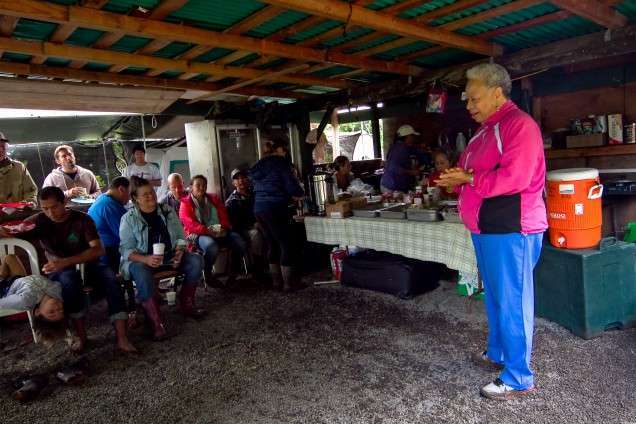 On a Friday morning 26 community leaders, from 15 communities on 6 islands gathered at a small shed at the end of the road in the remote Kauai community of Haena. The rain pounded on and off on the roof, and we huddled together and shared. It was a moving experience to watch Mel and Ammie share their story and find the connective thread — shared pain of generational land loss, alienation from land, as well as the shared and hopeful story of those who hold on, restoring place and meaning. Contemporary effective natural resource management requires bridging communities and government(s) to the same table. Nobody can do it all alone. Moreover, relationships and networks develop between human beings, whether grassroots efforts, agencies and/ or bureaucrats requires making time and space to build the trust and requisite spirit of humility for group activities of mind, body and spirit. Gathering is a potentially powerful tool for organizing and capacity-building. We believe that when people can come together in the right context and are facilitated in finding alignment, they become generative — they co-learn and co-create — over time and self-identify how to leverage their efforts towards solutions of their own design. We will continue to reflect on our time spent together, and seek opportunities for collaborations for the upcoming IUCN World Conservation Congress. Mahalo nui to Audubon and the Toyota TogetherGreen Fellowship Program for their generous support! Photos above by Kim Moa. Mahalo Kim! ← The Enduring Song of Uncle Henry Chang Wo Jr.